This month Rose turns 5. It seems like only yesterday she was a baby who slept and ate and was happy all the time. She still (mostly) eats and sleeps and is happy, but there’s a lot more going on with her now. As a baby, Rose was vastly different than Emma was. Where Emma only ever nursed, or slept while being held, Rose would fall asleep playing on the floor, or even all by herself in the bassinet or crib. She was a wonder to me after my super fussy first baby. As she turns 5 she is still a wonder to me, and still so different from her sister. The biggest wonder to me right now is how well these girls get along. 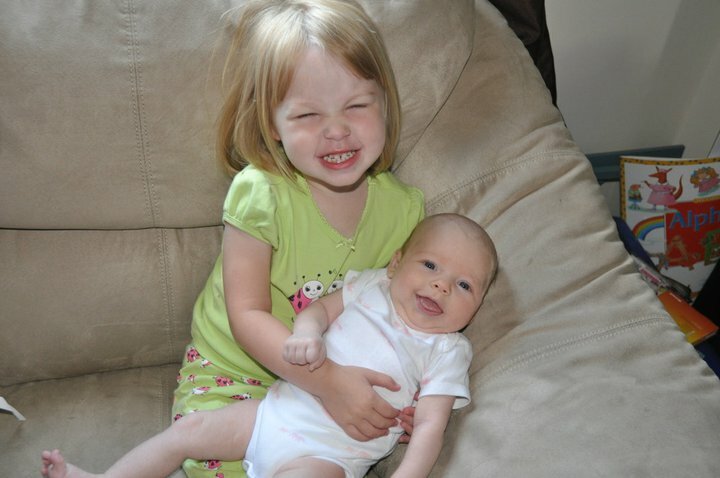 Emma was 2.5 when Rose was born, but from the very beginning they were fast friends. Sure they squabble, but they’re siblings – something would be very wrong if they didn’t! Overall they share well and play together all the time. Emma likes to help, and Rose often needs help, so that usually works out in my favour. We’ve learned a lot in our 7 years of raising Emma, but we’re finding what worked for her doesn’t always work for Rose. This parenting thing is still a steep learning curve, even after almost a decade. I know I’m very different from my sister, but until you’re parenting more than one kid, you don’t really understand what that means for a family dynamic. As we’re working with Emma to get her maybe into acting or modelling, Rose is the one around the house who is singing continually, acting out play scenarios all the time, and just generally being more outgoing and imaginative. Maybe she’ll get an interest in performing as well – already she’s very excited to do her ballet performance on the “big stage” at the Grand Theatre in June. The world Rose lives in is amazing. She doesn’t have one favourite toy – she take great pleasure in choosing which (of her 1,000) stuffies she’d like to cuddle with tonight. She’ll play with anyone, and she’ll chase after people she knows on the street, or in the mall, just to say hi and give them a hug. She has a huge heart and loves to cuddle – she’d be in my lap every minute if I let her. I can’t wait to see the changes as Rose turns 5 and really leaves those “pre-school” years behind. She already is a very happy kindergarten-er. She’s learned a lot at JK this year. I’m suspicious she’ll be a quicker reader than Emma was. She already “reads” to me and is interested in doing math. Maybe she got my desire to learn – I loved school! I guess only time will tell. I’m very glad I have this blog as a place to express my feeling and thoughts about my kiddos, and for other people to share in. I know reading about similar lifestyles and issues we may be having helps me feel like I’m not alone as a parent. (I mean I’m not alone, I do have my husband and family!) So if you enjoy these “milestone” posts, or the ones I make about our struggles and other parenting fails we may have, please leave a comment so I know you were here and shared in this moment in my life. Oh ya, and in case you didn’t figure it out, I can’t believe this is the year Rose turns 5! How is she so grown-up already?? Hi Jess – Your girls are lovely. Thanks so much for sharing with the Let’s Get Real party. You are very welcome – and thanks, I think they’re pretty great too!